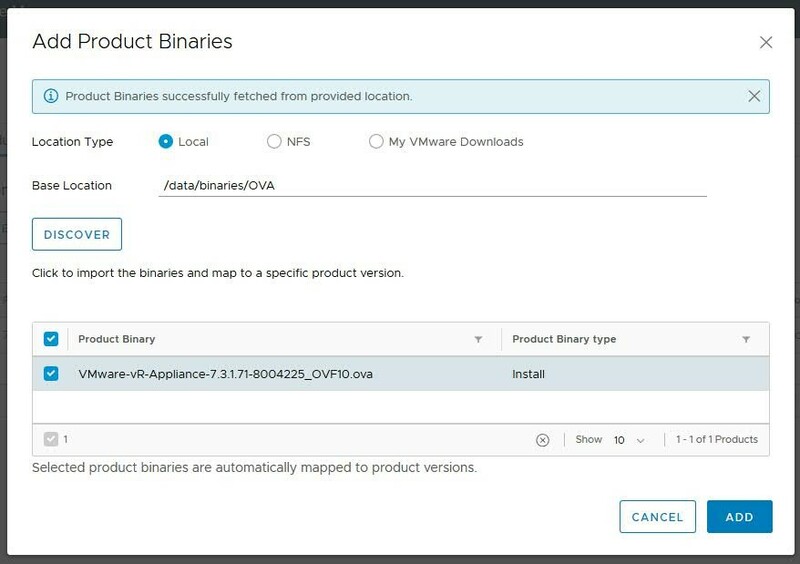 Use a supported Web browser to connect to your vRealize Suite Lifecycle Manager appliance by using the appliance's IP address. 2 Enter the administrator user name. If you are logging in to vRealize Suite Lifecycle Manager for the first time, reset the root password. 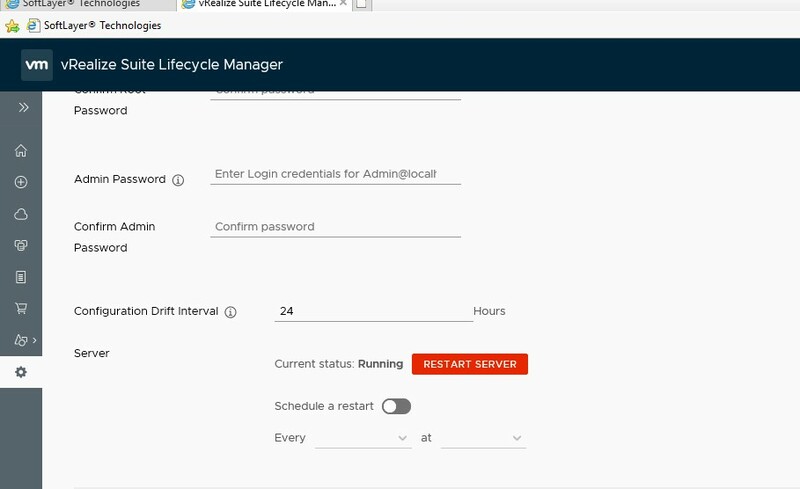 Configure a new administrator password and other vRealize Suite Lifecycle Manager settings, such as and SSH settings and configuration drift interval. The first time you view the common configuration page, you must provide data for all available settings to save any settings. 1 Click Settings and click the System Settings tab. 2 Type new passwords for root, administrator, and SSH users. 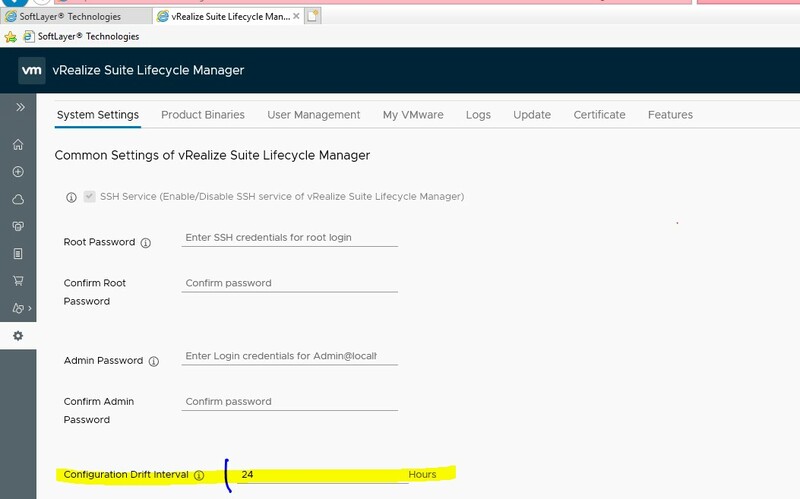 Set the interval of time vRealize Suite Lifecycle Manager uses to collect data for configuration drift reports. 2 Enter the Configuration Drift interval in hours. You can restart the vRealize Suite Lifecycle Manager server immediately or schedule weekly server restarts. 2 To restart the server immediately, click RESTART SERVER. 3 To schedule a weekly server restart, select Schedule a restart and select the day of the week and time for the weekly restart. If content management is enabled, then SSH is enabled automatically and it cannot be disabled. Force disablement of SSH causes malfunction of Content Lifecycle Management functionality. As a best practice, disable SSH in a production environment, and activate it only to troubleshoot problems that you cannot resolve by other means. Leave it enabled only while needed for a specific purpose and in accordance with your organization's security policies. 2 Select SSH Enabled to enable SSH connections or deselect it to disable SSH connections. 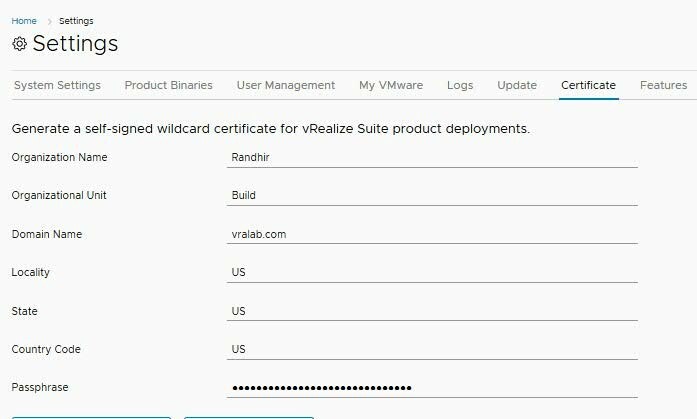 Prerequisites To use an Product Binary downloaded from My VMware, verify that you have registered with My VMware and registered My VMware services with vRealize Suite Lifecycle Manager. 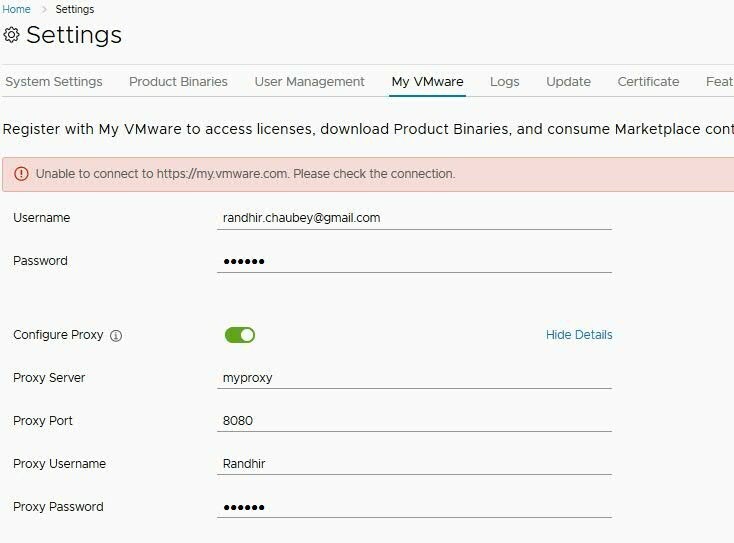 See Configure My VMware Settings. 1 Click Settings and click the Product Binaries tab. 3 Select the location type. 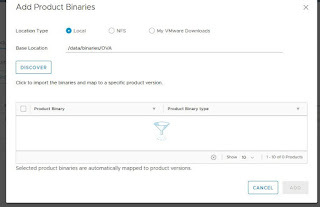 Select either Local or NFS to map to a downloaded product binary with products dependent on the product binary location, or select My VMware to map to product binary downloaded from My VMware. 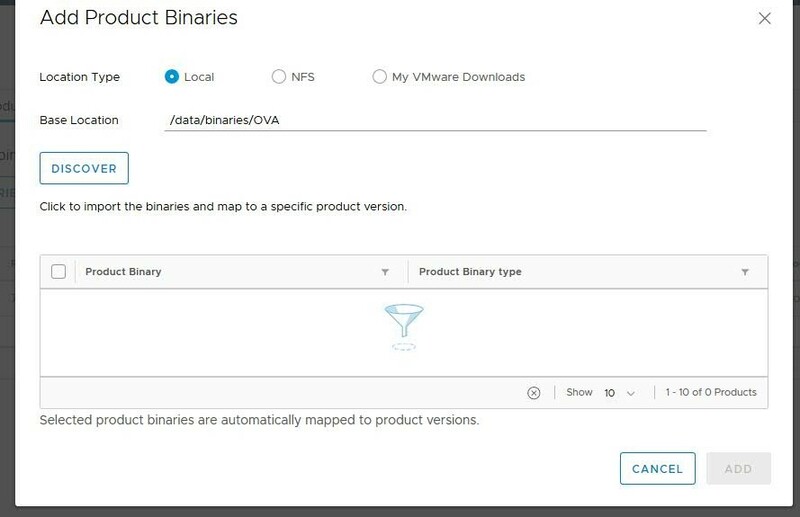 Note To download product binaries from My VMware, click Product Binaries tab, and click the downloaded arrow under Actions for the Product Binary to download. 5 Select the Product Binary file from the Product Binary list. 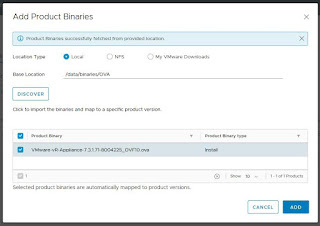 Verify that you have an existing VMware Identity Manager version 2.9.2 or 3.2.0 as vRealize Suite Lifecycle Manager supports only these versions. · Click ADD ACTIVE DIRECTORY at the bottom of the page and provide active directory details. · Enter the Active Directory Domain Name, Base DN, Bind DN username and password. · Accept the EULA and provide the Infra and network details. · Enter host and IP details, and passwords for root and SSH user. · Click Submit and click SAVE to close the wizard. 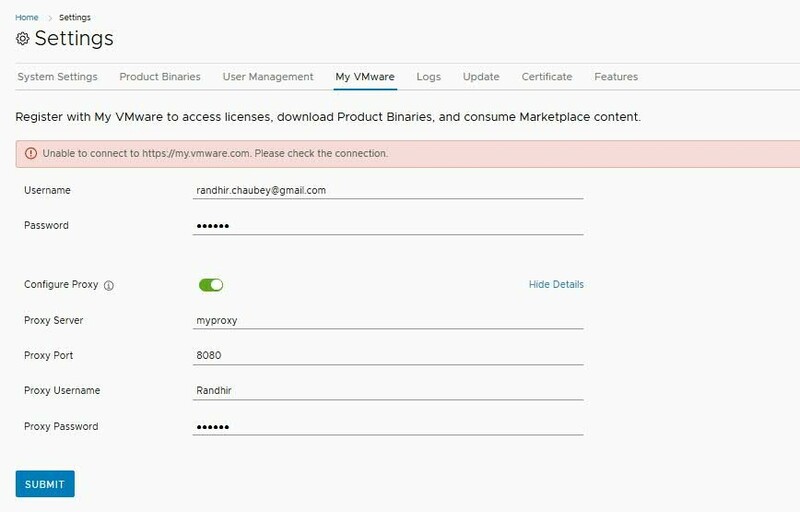 Enter your My VMware user name and password to enable vRealize Suite Lifecycle Manager to download product Binary through My VMware. 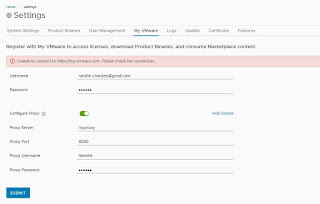 You can also enter using the proxy server under MyVMware Settings. 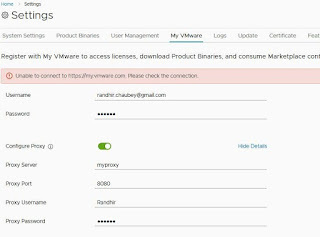 If you are using a proxy server in your network, you must configure the proxy server in vRealize Suite Lifecycle Manager. If you are enabling proxy, enter the server, port, user name, and password for the proxy server. 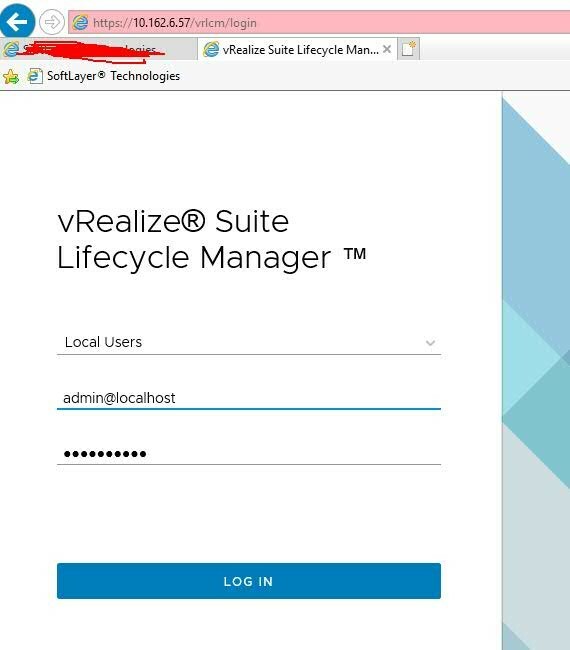 You can configure the level of information vRealize Suite Lifecycle Manager collects in log files and the number of log files for vRealize Suite Lifecycle Manager to keep. In the Select Log File Count drop-down menu, select the number of log files for vRealize Suite Lifecycle Manager to keep. Click Settings and click the Certificate tab. Enter the Organization name and Unit name. For example, Organizaton name. 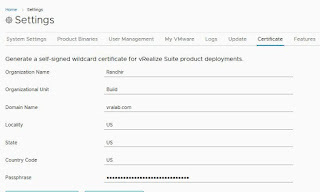 vRealize Suite Lifecycle Manager generates a new Wild card certificate for the specific domain provided by the user.